It took a little over two months for Jordy’s family to decide once and for all that they didn’t want to make him a part of their lives anymore. And so on one sunny, California afternoon, they rounded up all his toys, some food, and his favorite blanket, and surrendered him to the Carson Animal Shepherd in Gardena, California. Jordy, who is barely 2-months-old, was confused by the stunning betrayal that quite literally sent shockwaves to his small frame. According to my source at the shelter, he immediately shut down emotionally, lifting his tiny head only to eat occasionally and sip small gulps of water to temporarily distract him from the pain of rejection. Unfortunately for Jordy, the stakes couldn’t be anymore higher than they are. That’s because if he doesn’t find a home within the coming weeks, he could be put down to free up valuable kennel space, as the Carson Animal Shelter grapples with overcrowding and limited resources. At his age, Jordy should not be crying himself to sleep every night. He should be out in a field playing somewhere enjoying all the hugs and kisses from doting parents who care deeply for him. Instead, he makes a cold concrete slab, and some chewed up toys as his only solace from the pain. 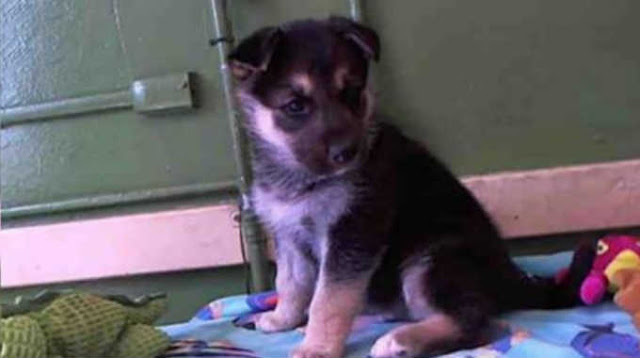 Fidonation, if you or someone you know is interested in giving this precious pup the forever family he rightfully deserves, please contact the Los Angeles County Animal Control – Carson at (310) 523-9566 and reference the shelter ID #A5041776. Additionally, please share this story on Facebook or Twitter, so we are closer to finding Jordy a new home.